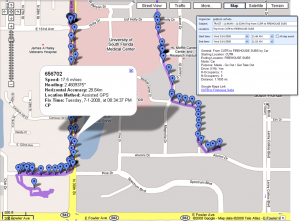 TRAC-IT is an innovative mobile phone app that is able to collect high-resolution travel behavior data that are instantly transferred to a server for analysis by transportation professionals and automated software systems. A mobile phone with TRAC-IT installed easily fits in a person’s pocket and can record true multimodal travel using car, bus, bike, and walk. TRAC-IT implements several patented and patent-pending, battery-smart technologies that enable the phone battery to last more than an entire day, even when GPS is being sampled as frequently as every second while the user is moving. Since data is transferred to the TRAC-IT server as it is being collected, TRAC-IT can be deployed into the field indefinitely to record behavior without needing to collect the devices to retrieve data. For more information on the smart battery-saving technology underlying TRAC-IT, see our “Technology” page. 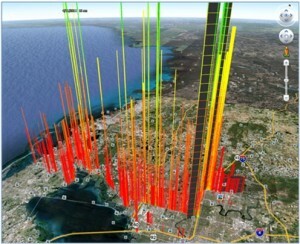 There are also several data processing modules that produce information from raw tracking data about points-of-interest (via clustering), mode of transportation (via artifical neural networks), and trip purpose (via geographic information systems). 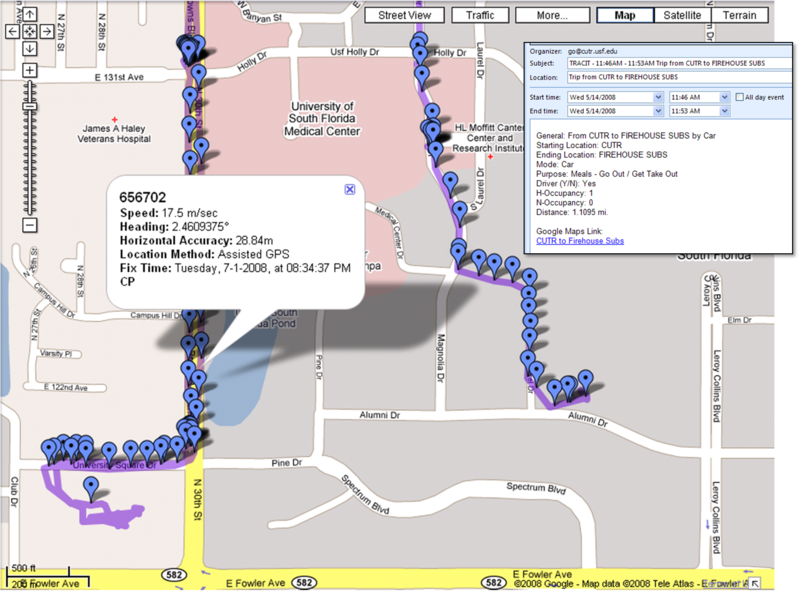 Since TRAC-IT sends GPS data from the phone to a server in real-time, TRAC-IT also can provide personalized, predictive real-time location-based services (e.g., traffic alerts, location-based advertising) that benefits the end-user and gives the user a direct incentive for continuing to participate in long-term travel surveys. Read more about TRAC-IT’s real-time location-based services in the Dynamic Travel Info research project. TRAC-IT also integrates Personal Travel Coach technology, which can provide personalizes suggestions to users that may help them save time and money by streamlining their travel behavior. The Personal Travel Coach was designed to support Transportation Demand Management strategies and policies to seek to increase transportation system efficiency and achieve specific objectives such as reduced traffic congestion, road and parking cost savings, increased safety, improved mobility for non-drivers, energy conservation, and pollution emission reductions. Read more about the Personal Travel Coach in a TRAC-IT report. TRAC-IT users can now log into our participant website. Paola A. Gonzalez, Jeremy S. Weinstein, Sean J. Barbeau, Miguel A. Labrador, Philip L. Winters, Nevine L. Georggi, Rafael A. Perez. “Automating Mode Detection for Travel Behavior Analysis by Using GPS-enabled Mobile Phones and Neural Networks,”Institution of Engineering and Technology (IET) Intelligent Transportation Systems, 2010, Vol. 4, Iss. 1, pp. 37–49. doi: 10.1049/iet-its.2009.0029. © The Institution of Engineering and Technology 2010. Reducing vehicle trips and vehicle miles of travel (VMT) are part of a multifaceted approach that addresses the growing traffic congestion problems. Previous research analyzed household travel patterns and provided personalized advice to participants to encourage the reduction of vehicle trips and VMT. An analysis of covariance conducted on the average contributed VMT and vehicle trips used the post-advice period’s travel patterns as the dependent variable. The provision of suggestions had a statistically significant effect on VMT and trip numbers contributed. Overall, this experiment showed that the provision of feedback would reduce VMT. However, the labor and time-intensive post-processing costs hampered widespread application. This project sought to overcome this limitation by using the expanded capabilities and falling prices of Personal Digital Assistants (PDA) and cellular phones in combination with Global Positioning Systems (GPS). This system, “TRAC-IT” offers an opportunity to improve the quality of collected data while reducing associated collection and processing costs and errors. TRAC-IT Phase 1 final report. Making smart travel choices require understanding the operation of the transportation system and influencing the use of public transportation. 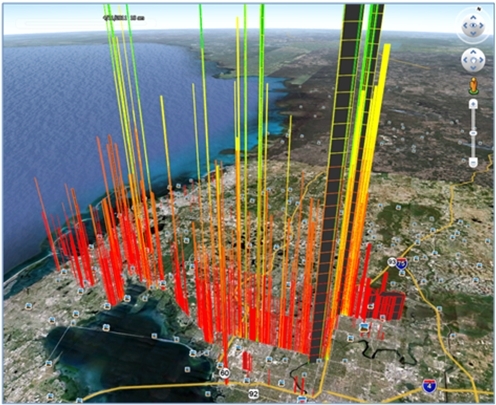 This knowledge begins with collecting data to measure or monitor travel behavior. This research project is Phase II of the ongoing NCTR project “Traveling Smart: Increasing Transit Ridership by Automatic Collection (TRAC) of Individual Travel Behavior Data and Personalized Feedback” or TRAC-IT. The focus of Phase I was to design, implement and test a portable automatic activity diary system. A personal digital assistance (PDA) combined with a global positioning system (GPS) was assembled as one unit PDA/GPS and loaded with an activity diary that collects information such as travel purpose, origin, destination, travel time & path, speed, occupancy, etc. Additionally, a “GPS-Enabled” cell phone was identified as a possible cost-effective replacement for the PDA/GPS device combination and could even provide additional benefits such as extended battery-life and increased portability due to its smaller size. Also, the task of building a prototype expert system that provides customized feedback advice tailored to an individual’s travel behavior patterns was completed. Can you please tell me if Trac-It is commercially available yet? I am undertaking a Master’s Degree and part of my research includes behvioural change for transportation. As one avenue I am looking at social media, as well as IT applications to influence change, and am very interested in the Trac-It technology and results. Increasing Transit Ridership Through Automated Collection (TRAC) is very useful to us..It helps us in several ways..A mobile phone with TRAC-IT installed easily fits in a person’s pocket and can record true multimodal travel using car, bus, bike, and walk…It also provides traffic alerts, location-based advertising..Thank you.. I would also like to know about this app. We’re currently looking to use something similar in Perth, WA. Please contact me if you can provide any further information.